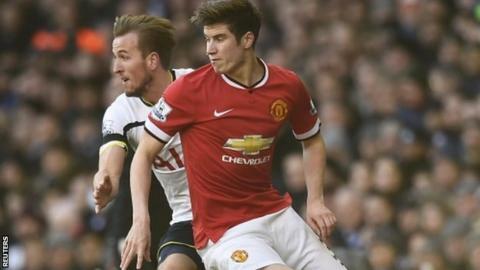 Manchester United are still to agree contracts with youngsters Paddy McNair and Tyler Blackett. The defenders have both broken into the United first-team squad following Louis van Gaal's arrival as manager. McNair, 19, made his 10th senior appearance in the FA Cup tie at Yeovil, whilst Blackett, 20, reached the same landmark as a substitute in the Premier League defeat by Southampton. As of 1 January, they have been free to talk to other European clubs. United have refused to discuss whether they intend to make further offers to the defenders. Midfield prospect Andreas Pereira, 19, another academy graduate, is out of contract at the end of the season and in the same position. However, Pereira has played only once at senior level, against MK Dons in the 4-0 League Cup defeat in August. McNair and Blackett have been given opportunities this season mainly due to injuries to senior defenders Jonny Evans, Phil Jones, Chris Smalling and Marcos Rojo. But McNair, who was called into Northern Ireland senior squad by coach Michael O'Neill for the Euro 2016 qualifier against Romania in November, did reject an initial offer. No further progress has been made since. What next for Man Utd? Read more on Man Utd: Will the Glazer family own the club in another 10 years' time?